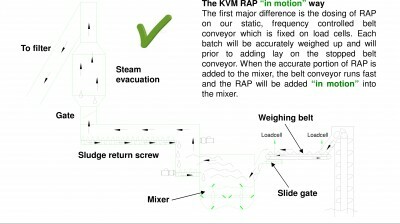 Adding cold RAP to the mixer via a KVM weighing belt provides the possibility to use up to 35% of the overall production. 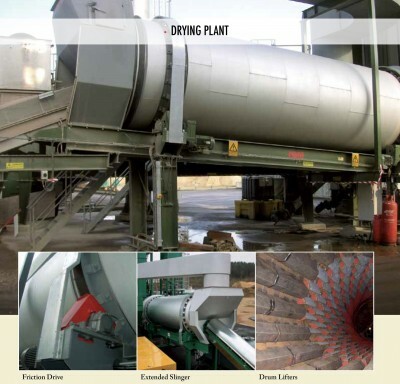 This option will require additional exhaust from the mixer with a sludge return system. Adding cold RAP into the inlet ring on the drying drum provides the possibility to use up to 50% of the overall production. The patented KVM 3 point temperature measuring system secures high quality production. 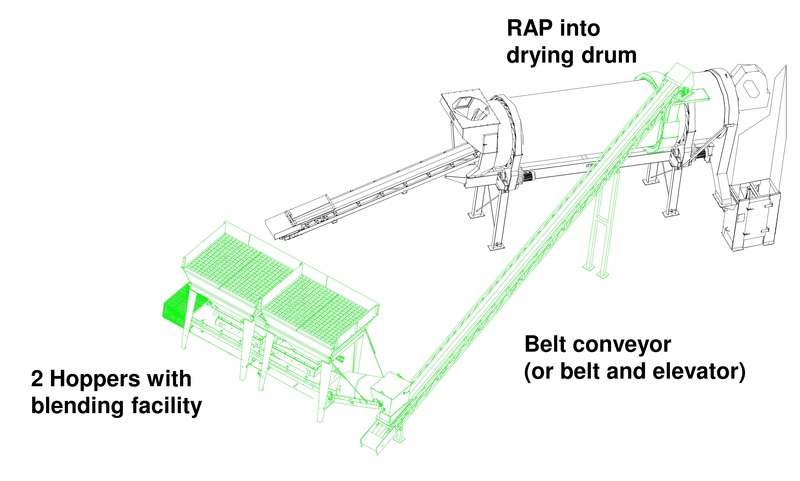 The first major difference is the dosing of RAP on our static, frequency controlled belt conveyor which is fixed on load cells. Each batch will be accurately weighed up and will prior to adding lay on the stopped belt conveyor. 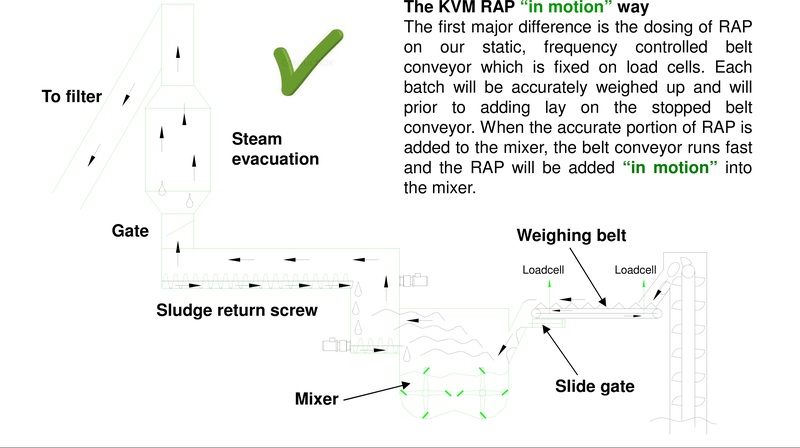 When the accurate portion of RAP is added to the mixer, the belt conveyor runs fast and the RAP will be added “in motion” into the mixer. 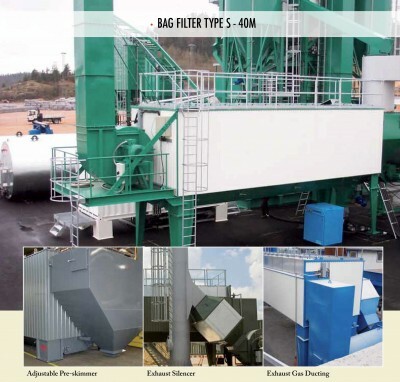 The KVM cold feed hoppers are designed as a flexible and modular system, developed for the rough environment created by the heavy wheel loaders. 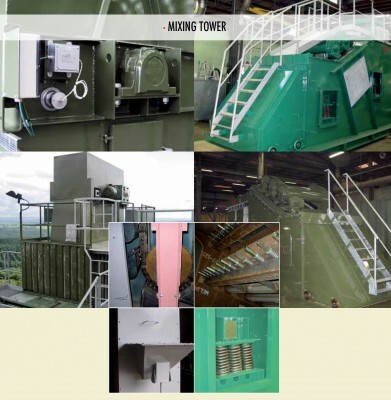 Three different loading widths are standard, offering you hopper sizes from 12 m3 to 20 m3. 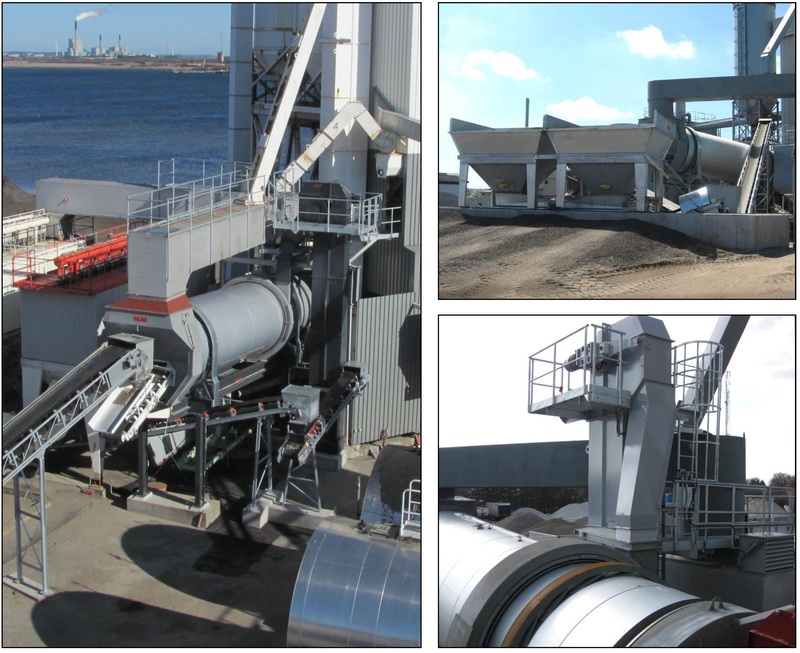 Excellent discharge facilities are insured by the ingenious design, which includes steep side walls in the bin. A wide range of auxiliary equipment is available i.e. screening grids, man grids, wearing plates, vibrators, level gauges, special low friction liners and sheeted canopies. The KVM belt feeders are fully galvanized stand-alone units, designed on the basis of decades of experience. The belt feeders are available in several sizes and they are, as standard, fitted with flow switches and adjustable outlet gates. The rubber belt is a strong design, allowing you to use all kinds of aggregates. The electrical motor is, as standard, fitted with a temperature gauge, securing the motor against overheating when running long time at low frequencies. wide range of burners for all kinds of known fuel types. The drum is fitted with replaceable lifters, that are bolted in position and the drum shell is made of heavy steel plates ensuring a long lifetime. The lifters have been developed through years of experience and the special KVM design ensures you an excellent heat transfer to the aggregates passing through the drum. The drum is insulated to prevent heat loss and the special friction drive, fitted with high temperature resistant polyamide drive rollers, gives you a silent plant. The outlet chute is fitted with replaceable liners and a temperature gauge controlling the dried aggregate temperature. A wide range of auxiliary equipment like slinger belts and access platforms for both cold and hot end of the drum is available. The development of the KVM bag filter is based on our general environmental policy and we are proud that years of environmental concern has given us the opportunity to offer you this excellent bag filter. The KVM bag filter is divided into sections, each holding 52 vertically fitted bags which are pneumatically cleaned by compressed air. The pressure drop over the bags automatically controls the cleaning of the bags. The bag house is made of Corten steel plates, ensuring a long lifetime and it is insulated to minimise temperature loss. The bags are manufactured of high temperature resistant 500 mg/m2 Aramid. The bag filter fan is directly driven and inverter controlled to reduce power consumption, and compared to other filter designs in the market, the KVM bag filter offers you a lower running cost. A wide range of auxiliary equipment is available, like pre-skimmers, exhaust gas ducting, stacks fitted with or without attenuator and emission control equipment. The process of lifting the hot aggregate material up into the mixing tower will vary from one plant to another, but the KVM programme has a hot elevator for any application. 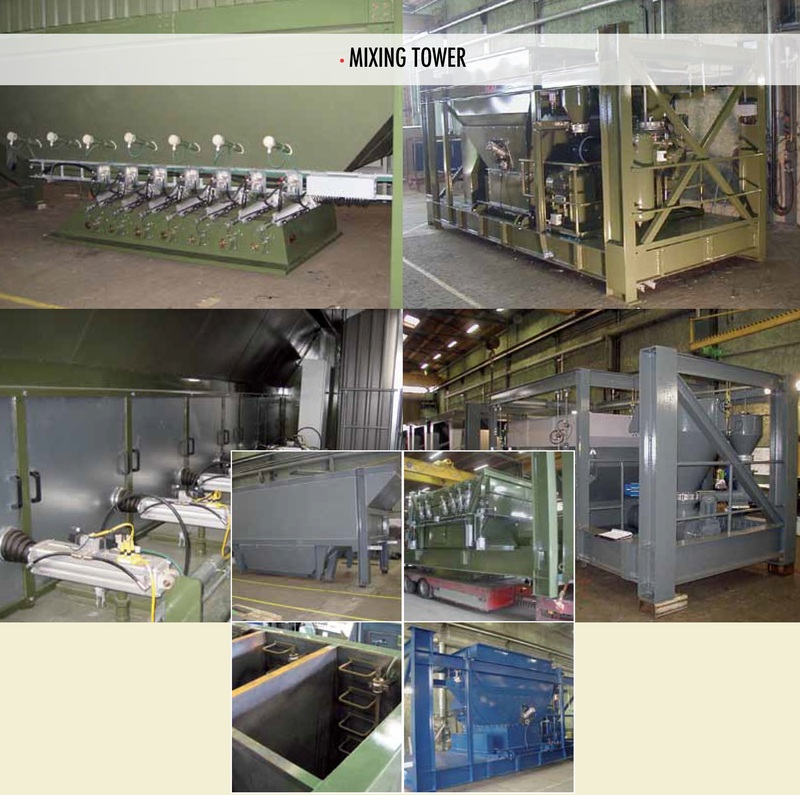 High reliability, low maintenance and wearing qualities are our main priorities for the elevator. The elevator is designed for friction drive, and as standard REX chains are used with gravity tension. The elevator is equipped with a rotation guard on top and sample taking in bottom. KVM screens are closed horizontal screens with dual oscillating elements that ensure accurate direct guided vibrations. The screen is guided by 4 spring suspensions with inclined springs. An indicator shows the amplitude of the vibrations. The screen can optionally have a by-pass gate with two wire-mesh channels that are easily removable thereby providing good working space for fitting or dismantling of the screens. The aggregate bins have compartments that correspond to the screen and the fractions of hot material passing through it. Should further compartments be needed, this can be obtained by dividing all of the compartments lengthwise into A- and B-sides and at the same time adding a diverted section below the screen. 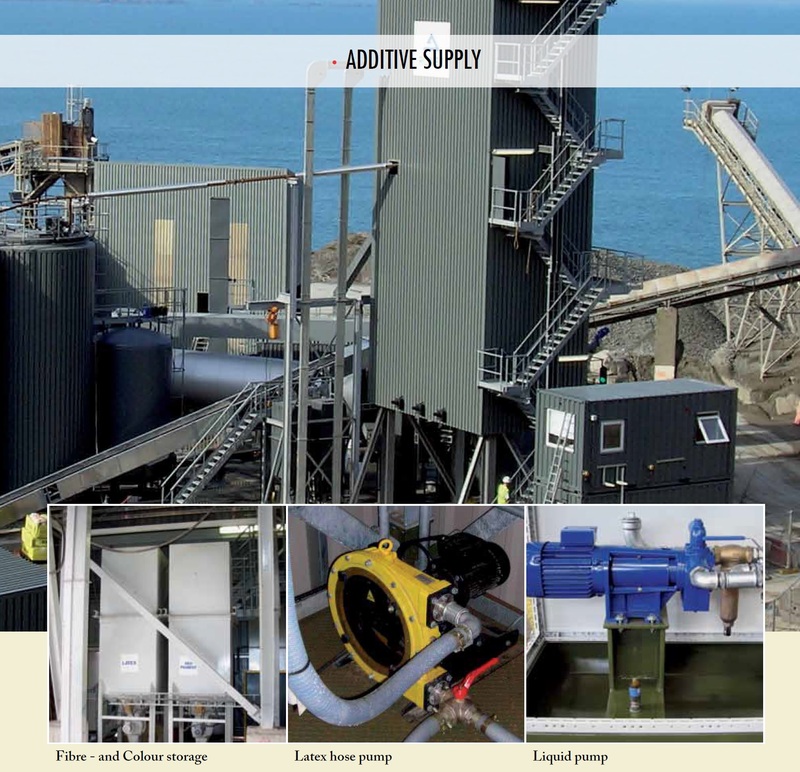 Discharge from the aggregate bin is possible via a number of pneumatic gates, actuated by dual step cylinders to ensure coarse and fine dosing at the highest accuracy. Each compartment has equipment for continuous level control, while a temperature sensor, can be built into each compartment. The most significant differences between the Viking, Freja and Odin models, are the shape of the scale and mixer sections. While the Viking and Freja models have scale and mixing units combined in one section, the Odin model differs by having these units built in two separate sections. 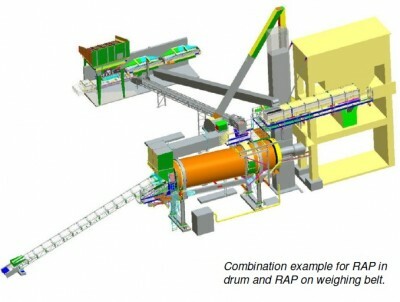 One section with much space for the mixer and the second section with scales for aggregate, filler, additive supply and a free standing bitumen scale. It applies to all three models that the aggregate scale is suspended freely inside its cover, so the weighing process is not affected by the common exhaust system. 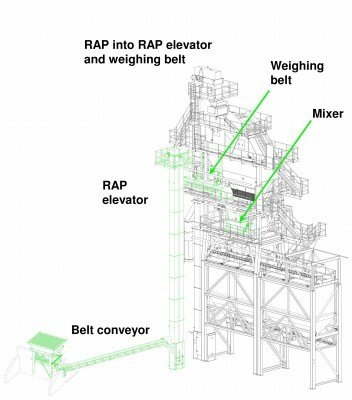 The mixing tower holds three scale hoppers, suspended on load cells above the mixer; one for aggregate, one for bitumen and one for filler. Additional weighing and dosing equipment can be fitted according to requirements. 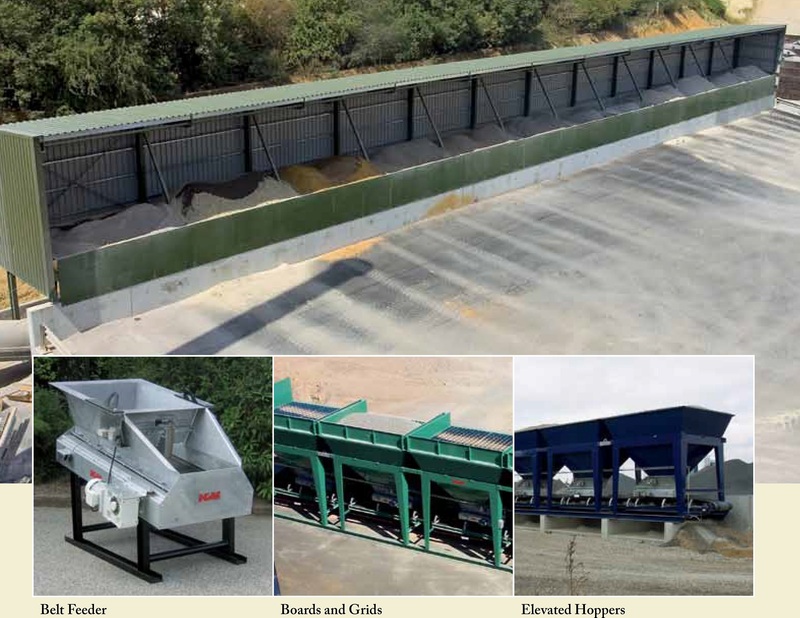 The Odin model has its aggregate scale divided into two compartments, thereby enabling the discharge of stone fractions in sequence. The bitumen scale is fitted with thermostatic controlled electrical heating elements. All the scales can be equipped with an automatically activated Scale Check System. Sturdy, reserves of power, minimum of wearing, and long lifetime are key words for the KVM twin-shaft mixers. Our asphalt mixers are constructed with a belt-drive between the electric motors and the gear boxes, which has the advantage of absorbing extreme peaks of loads and consequently protecting the gear boxes. Wear parts for mixing arms, claws and walls are cast using a hard wearing alloy and the shapes of these replaceable parts are designed to minimise wearing and tearing. The pneumatic operated discharge gate is designed as an upside down sector gate. 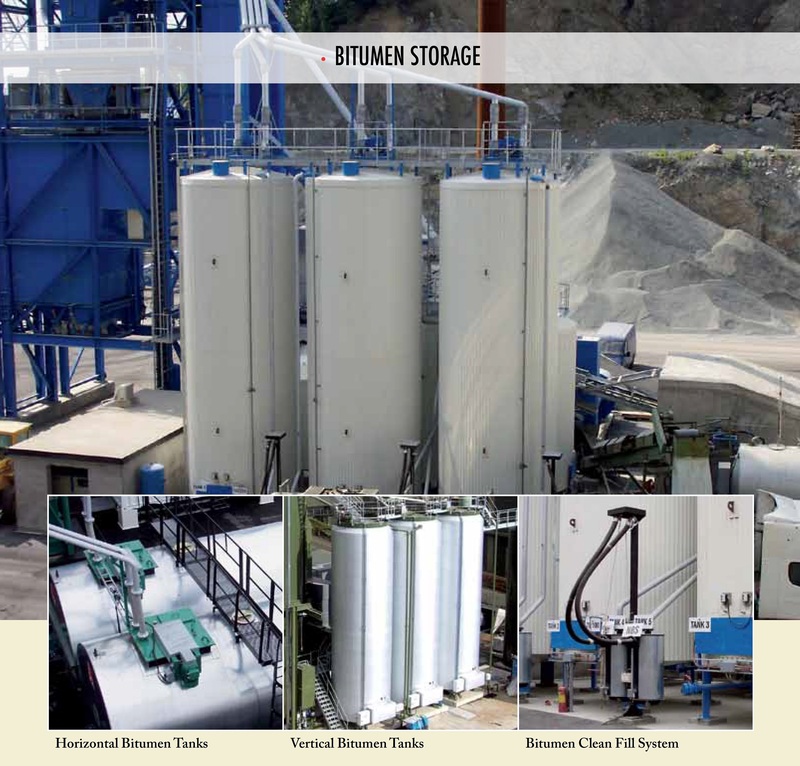 The KVM bitumen storage system is available with either horizontal or vertical installed tanks. All tanks are insulated with 300 mm insulation and a single metal sheet gives the final finish. The tanks are heated by electrical heating elements which are submersed in the lower part of the tank. Each tank is fitted with a control panel, watching and controlling the temperature in the tank. KVM can offer 2 types of pumps: the free standing type, which can serve several tanks, or the submersed type, which can serve one tank only. The free standing pump is trace heated and insulated, and the submersed pump is heated by the circulation of the bitumen. A wide range of bitumen valves and pipes are available, designed for each particular job. The Bitumen Clean Fill System ensures spillage is avoided when filling the tanks. Access ladders and platforms are available as auxiliary equipment. KVM offers different kinds of safety equipment to go with the bitumen storage. 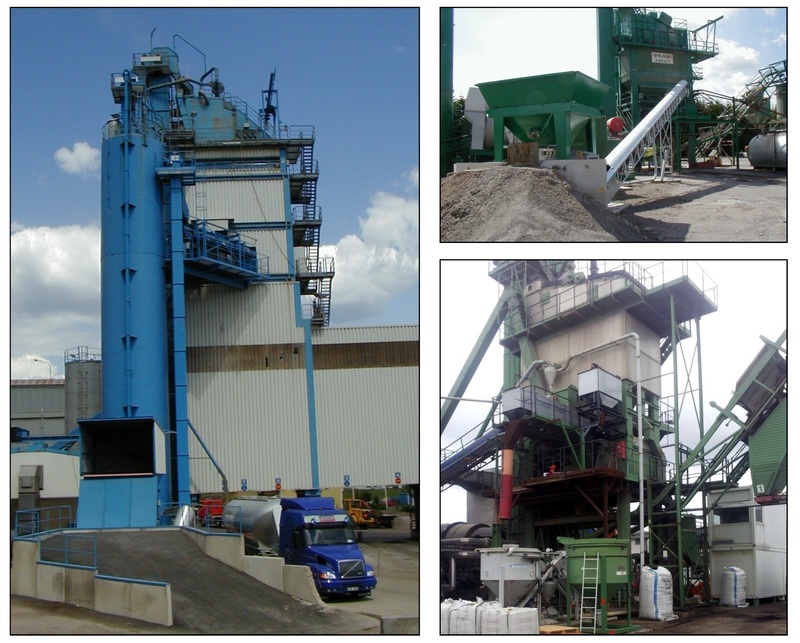 In advanced asphalt production the addition of small ingredients with specific qualities has increasingly become the way for a better product. Characteristic for most additions are the small quantities and the need for special equipment for storage and dosing. The handling and dosing methods will vary according to the nature of each component. Different components means different types of storage bins, conveying systems and scale systems. For example the handling of fibre pellets is completely different from handling loose powdered fibres. In other words making the right choice of equipment becomes crucial for obtaining exact dosing accuracy, even when it comes to handling plain colour granulates, polymers, wet fix or softening additives. Regardless of the additions being powders, granulates, pellets or liquids, KVM has a comprehensive equipment programme for the application. process control system from KVM gives the operator the perfect overview of the current plants status; providing the operator with the ability to make, find and run recipes and continuously carry out corrections to optimise the end-result. Reports are generated continuously, including production reports documenting material usage, alarms, variations, production capacity, fuel consumption and power consumption. Data from the drying process are logged every 10th second, so the operator can optimise this process too. The system is made as a classical PC/PLC system, based on a Windows platform and a central Allen Bradley PLC with decentralized I/O modules positioned in the high voltage panels. The software is based on Allen Bradley’s RS view with active-X files and the database is a structured DB4 system, consisting of standard Windows components. All collected data can easily be processed further in an Excel spreadsheet. 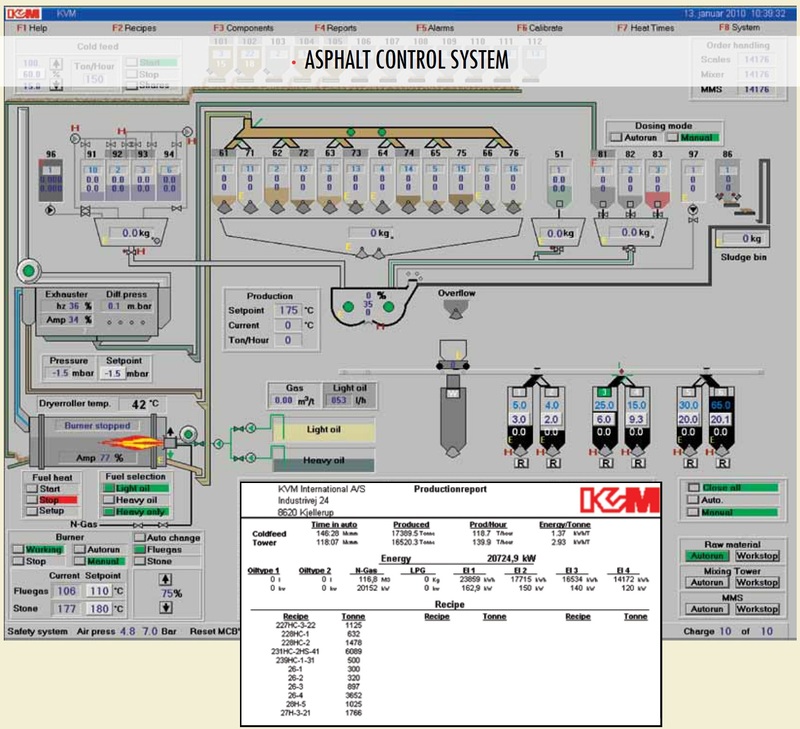 Data transmission between units in the plant is done via Control Net, Device Net and Ether Net. Therefore it is possible from the operator computer to see the status of inverters, weighing transmitters etc. Our online support is either based on traditional modem connection or a secure Cisco VPN internet connection that enables our technicians to support the control system.